To access the Settings area, you must be an administrator of your account. If you’re the account owner, you’re automatically an administrator. Click on the icon in the menu bar. The information you fill out in the Company Information section is used throughout your Kickserv account. The address is the billing address that appears on your invoices and estimates (unless you use a custom template to override that – more on that later). 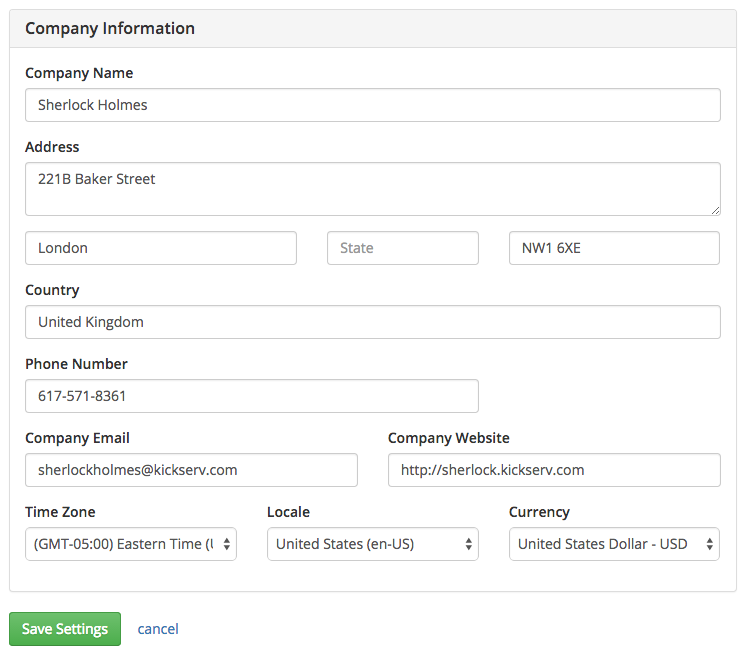 Selecting a specific Locale will change how addresses and currency are formatted. The Currency setting is used if you decide to setup online Customer Payments (more on that later, as well). Users are typically your employees, but you can also setup accounts for your external service providers as well, like accountants, CPAs, etc. To add a new user, click the New User button at the top of the Users list. While adding (or editing) a user, you can choose their Role. Technicians can only view work that is assigned to them. Staff users have access to all the work in your Kickserv account. You can optionally add an Avatar to help in identifying your users. Avatars appear on the Resource calendar and in the Users section. The General information is the user’s contact information. You can choose whether to give a user login access to Kickserv. A user without login access will still receive any email or text message notifications, but will not be able to login to Kickserv to view their jobs, track time, etc. You can also hide pricing from users that do not need to see it. This will hide pricing of all Items and Time Tracking tasks throughout Kickserv. To enable a user to receive notifications, you must fill out the appropriate fields in the Notifications section. You can enable Email or Mobile (text message) notifications, or both. As long as at least one of these is filled out (Email or Mobile) for the assigned user, clicking the notification button will alert that user. Once a user has been added, you can set their active or inactive state. 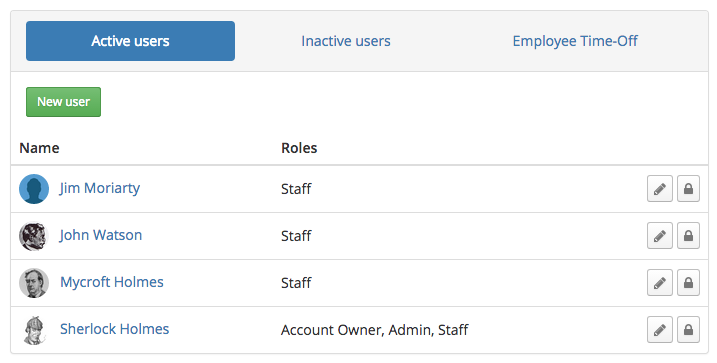 If an employee quits or you want to block access to a user, you can set their status to Inactive. Your Kickserv subscription allows a maximum number of Active users, so any Inactive users won’t count towards that number. 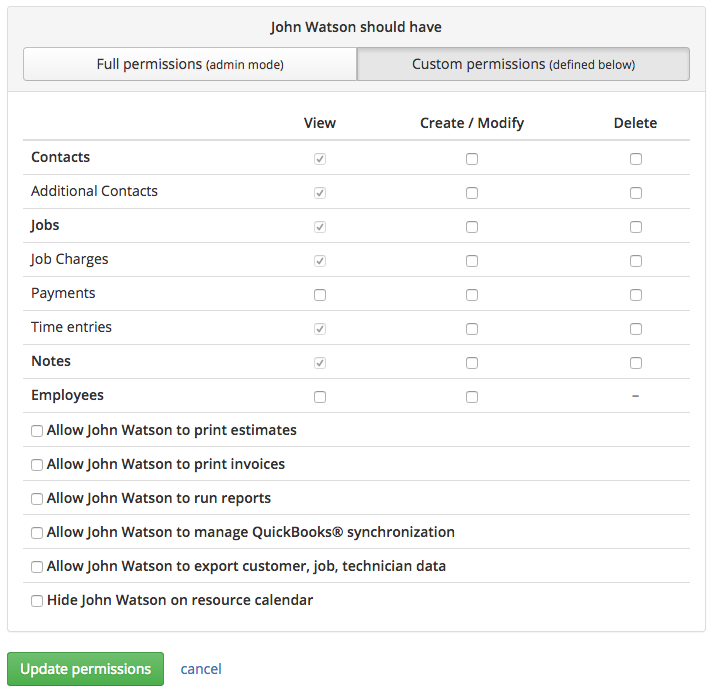 You can set fine-grained permissions on each user. The lock icon in the user list will bring you to the permissions page. You can automatically activate all permissions by clicking the Full permissions button. 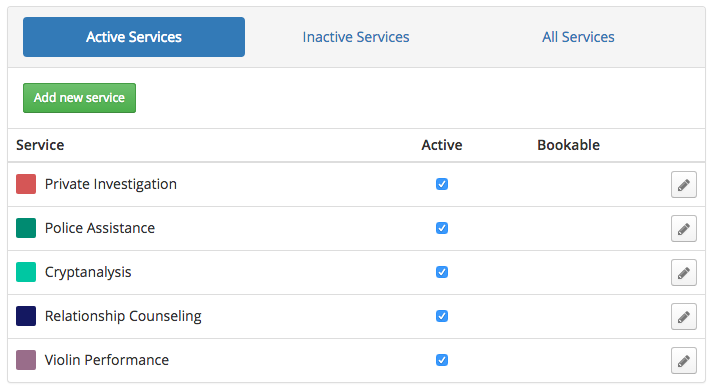 If you need control for individual areas of Kickserv, choose Custom permissions and set them as needed. 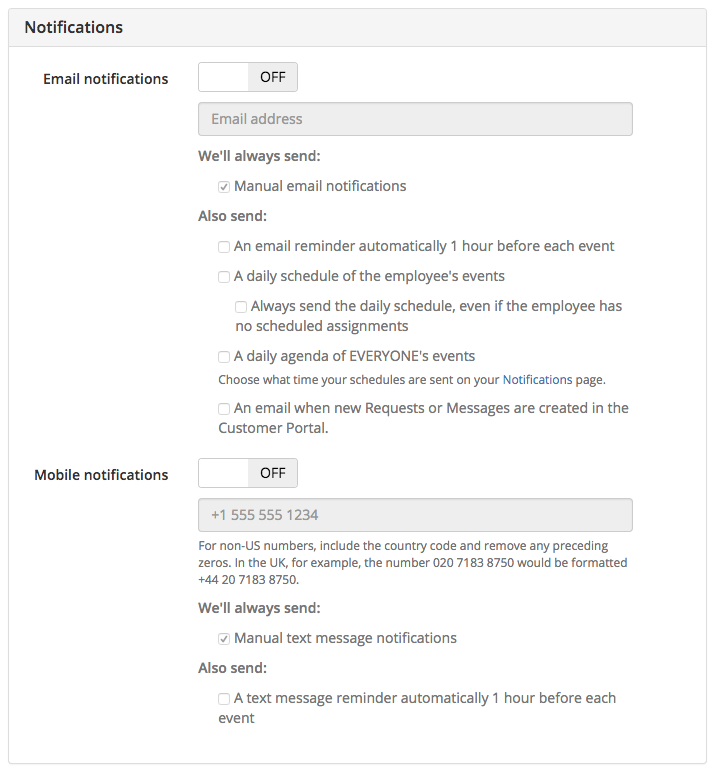 Company-wide notification settings can be customized here. A daily schedule will be sent to any users that have this enabled. You can choose the time it gets sent here, and whether to include tomorrow’s events. This is useful if you prefer to send you schedule in the evening. Any activity in the Portal (payments, estimate approvals) will get sent to the first email address. New work requests from the Lead Form will be sent to the second. Pro Tip: You can send these to more than one address. To include your logo in the Customer Portal as well as on invoices and estimates, upload it here. You can also select a custom color that is used on the sidebar menu throughout Kickserv. This area provides quick access to the customer-accessible pages of Kickserv. The Customer Portal allows your customers to login and view their invoices, view their work history, and make payments. 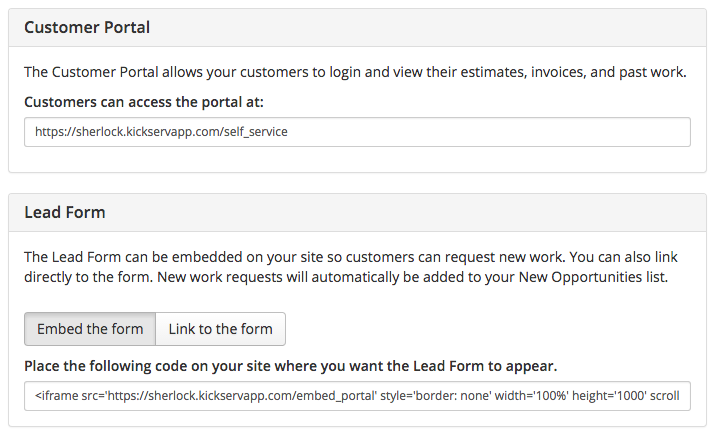 The Lead Form is a simple request form you can embed on your own website, or you can link directly to your Kickserv-provided Lead Form page. When a prospective customer fills out the Lead Form, a Contact record will be created and a new Opportunity will appear in your Opportunities list. A Service is a job or type of work you do often. For example, if you are a plumber, some of your services might be Drain Snaking, Repair Pipe Leak, or Repair Dripping Faucet. 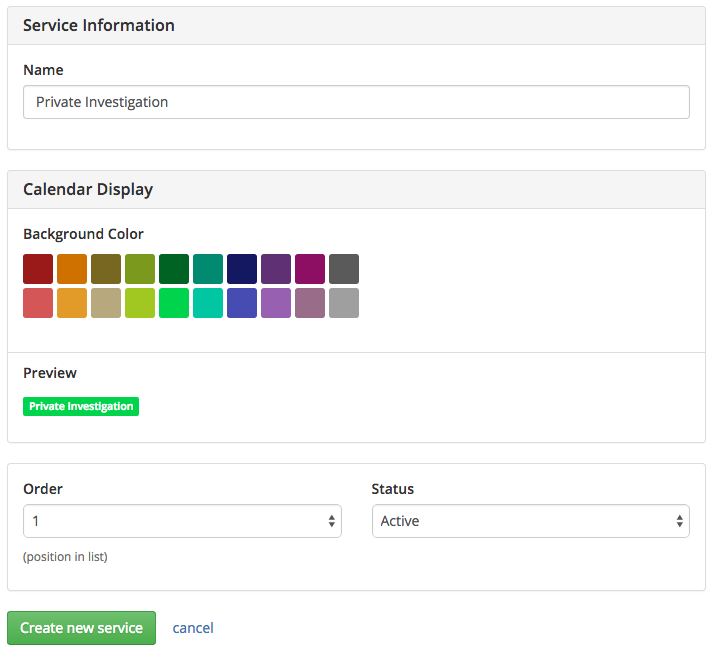 When adding a new service, you can choose which color that service should use on the calendar and resource views. Items are anything you charge for. This can be labor charges, products, or supplies that are needed to complete a job. 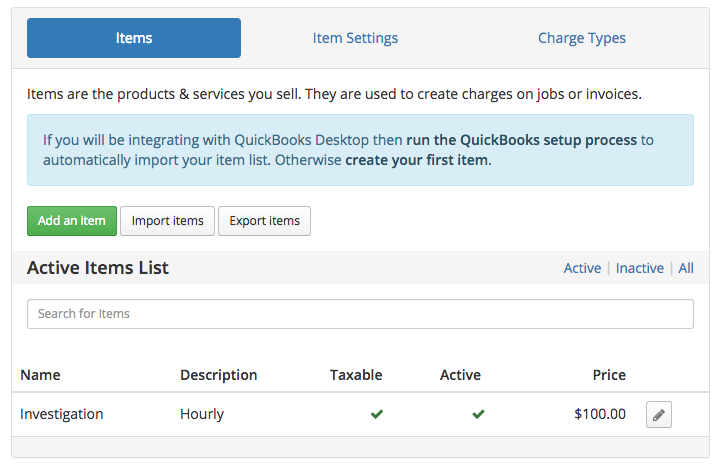 If you sync with QuickBooks®, your items list will automatically be imported and kept in sync. Note: If you use QuickBooks® Desktop, you should run the setup process first to import your items before creating any new items within Kickserv. Tags can be used for advanced filtering and reporting. 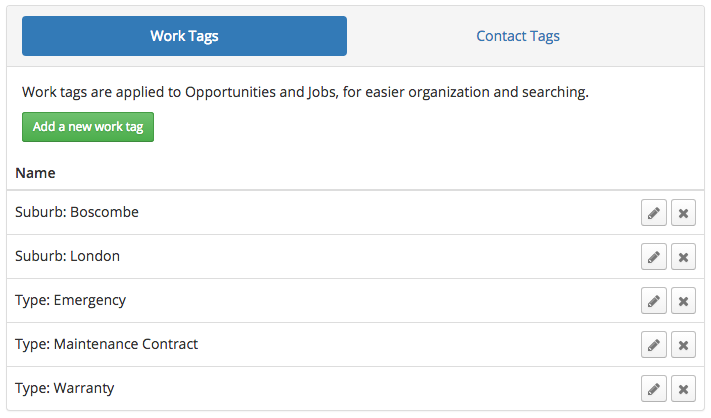 They are broken up into two categories: Work tags and Contact tags. Tax rates can be added and adjusted manually, but if you sync with QuickBooks®, Kickserv will automatically import them and keep them in sync. Customer Sources can be used in reporting and are a useful metric to track for marketing purposes. 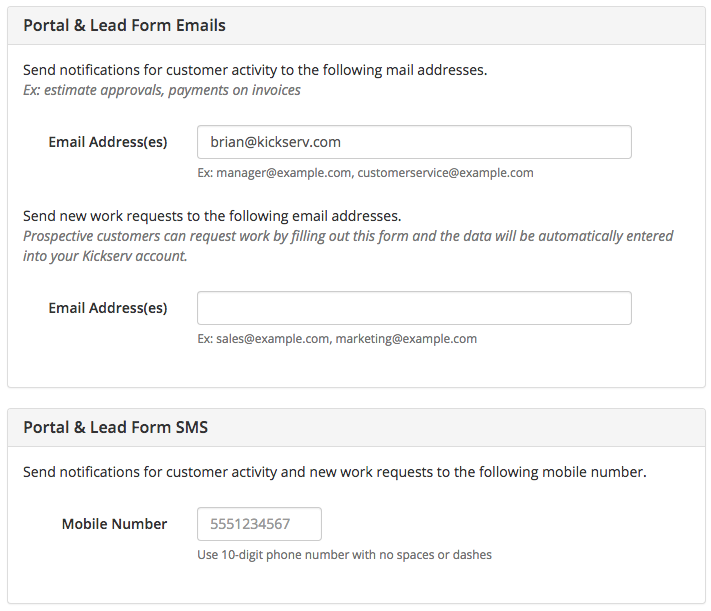 You can customize this list to suit your needs and assign a source to each new customer when you add them. 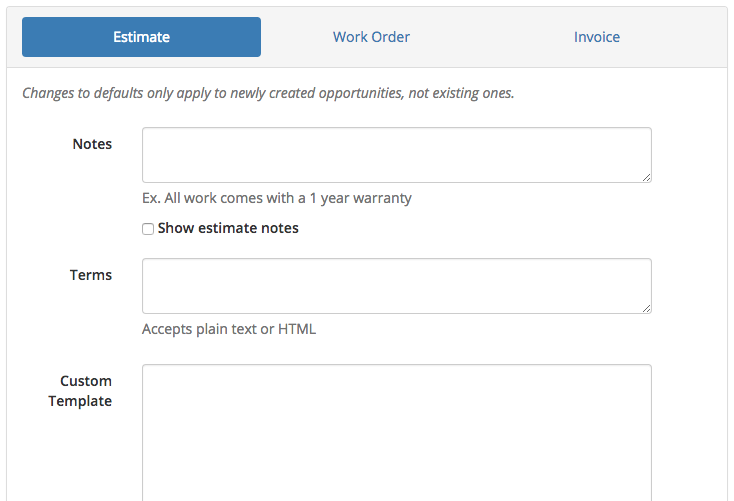 Document settings allow you to customize display and content options for your estimates, work orders, and invoices. You can set default values for Notes & Terms. These are editable on each estimate, invoice, or work order, so if you need to add a special note to a customer, you can. If you are using Custom Templates, you can replace the default Kickserv designs with your own. Custom Templates are constructed with standard HTML, CSS, and Liquid tags. Full documentation and code samples can be found in our documentation. Similar to document settings, you can set defaults for email messages that are sent from Kickserv. 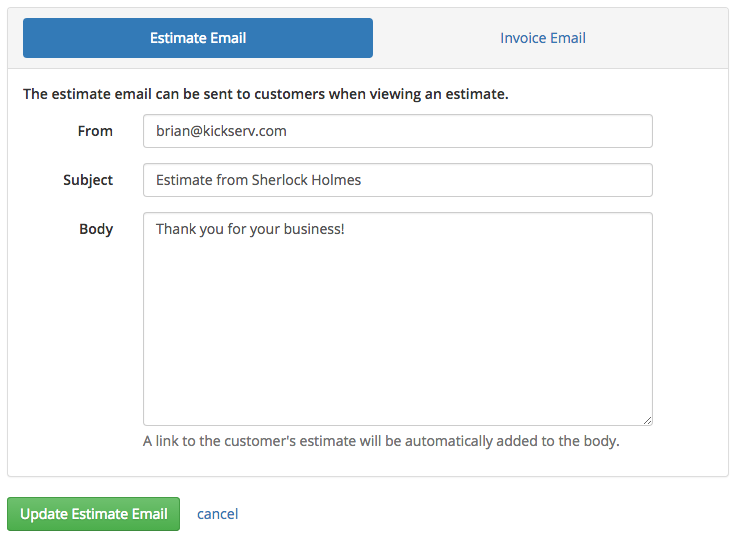 These default messages are used when emails are generated for estimate and invoice mailing. 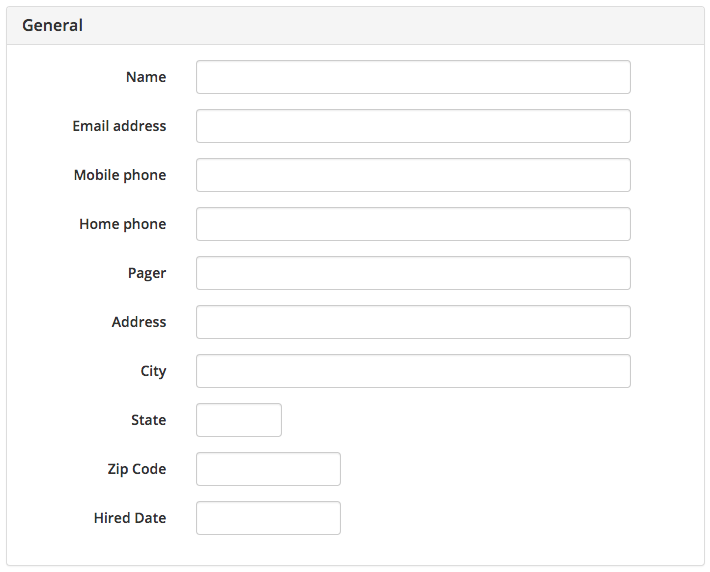 Custom fields allow you to capture additional information when creating Opportunities, Jobs, or Contacts. Contact Fieldsapply to Contacts, and Work Fields apply to Opportunities and Jobs. 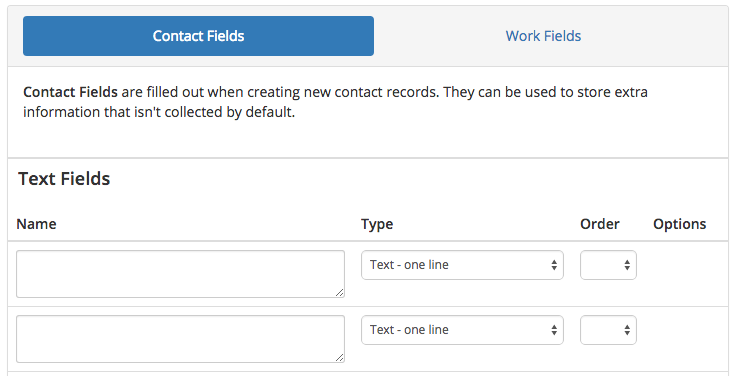 You can assign a number of custom fields in 3 types: text, date/time, or number. Custom fields can be used in reports. Add-ons allow you to connect external services to Kickserv. Our Customer Payments are handled through Stripe.com. Click the Setup online invoice payment button and you’ll be brought through the Stripe account setup. When you’re done, your Kickserv account will be linked to your Stripe account automatically, and you’ll be able to accept credit card payments online through the Customer Portal. You can connect QuickBooks® or Xero® to Kickserv. Watch a video walkthrough of this account setup guide. Now, if this article was the topic you were looking for how well did it answer all your questions? Click the different faces below that best describes your feeling towards this article.